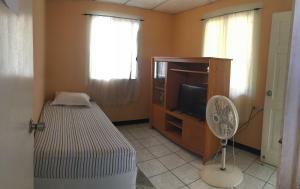 ﻿ Best Price on Hostal Nicaragua Guest House in Managua + Reviews! Hostal Nicaragua Guest House is in a residential part of the city, 3.7 mi from Managua Airport and 2.5 mi from Huembes Bus Station. Set in gardens, it offers a sun terrace and free Wi-Fi. Brightly decorated rooms feature a fan and cable TV. Each has tiled floors and wicker furniture. There is a work desk and the private bathroom comes with a shower and toiletries. A laundry service is available and you can hire a car or exchange currency at the tour desk. The lively nightlife of Bello Horizonte is a short walk from the Hostal Nicaragua. Transfer Hostal - Airport is available for an extra fee. This property is ideal for backpackers and groups and it is 5 minutes' walk from the Las Américas Shopping Mall, banks, supermarkets and sinemas. Mayoreo Bus Station is 3.1 mi away and UCA Bus Station is 7.5 mi away. Augusto Cesar Sandino International Airport is 5 mi away.